The skies over Wiltshire on the night of Saturday 8th August 1998, were both cloudless and star filled, with only a slight haze and a light, warm breeze. For Christopher Martin and Jonathan Browning, this was fortunate, as they had been seated atop the summit of Silbury Hill for about an hour since 9pm. They were watching, and video recording a Lunar Eclipse, which they were lucky enough to be in the right place for. However, noting that the time was now a little after 10pm, plus the fact that they had a long drive, all the way back to east London ahead of them, it was though to be a good idea to start making some tracks. So, upon packing away their gear they made their way down, along the narrow winding pathway, through the break in the fence and meandered out onto the A4 road. As they were negotiating their way along the side of the road, going towards the Silbury Hill, car park, they noticed a very bright object, out toward the north, which then very rapidly diminished from view within only a few seconds. "The object was much brighter than a star and did not seem to move appreciably". Just then, an elderly couple who moments earlier had seen what they said was a "spectacular meteorite, entering the atmosphere" greeted them. For about five minutes or so, Christopher and Jonathan engaged the couple in a light conversation concerning the object, however with the time pushing toward 10.30pm they bid the couple good night, and went on their way. When they entered the car park, Christopher then noticed a fairly large bright object heading in from the Northwest. Initially he assumed it to be an aeroplane, but as the object drew closer he could determine that there were three large and exceedingly bright lights on the underside of the craft. Having in his possession a Sony CD- TR840E Hi8XR video camera, Chris hurriedly unpacked it and trained the camera onto the object and began filming. As he zoomed in he immediately noticed that the object appeared to be of a black triangular shape with three bright lights positioned at the corners, with a smaller red light at the centre. Trailing slightly behind this highly illuminated object was a single glowing orb that looked to be separate from the main body of lights. The camera was operating with it's infra-red mode activated, which Chris quickly disabled at approximately twelve seconds into the filming, this afforded him with a more defined and coloured image in which he noticed that there were several other lights situated along both of the objects leading edges. The triangle then started to bank sharply and began to move with increasing speed, in a north easterly direction. As the object was performing this manoeuvre Christopher noticed that the trailing single light appeared to change its distance relative to the main object, further indicating the independent nature of the light. At this point Christopher stopped filming for a few seconds, in order to stretch out the tension that had built up in his hand. When he resumed filming, the object had shrunk considerably in size, indicating the great distance it had gained in those few intervening seconds and then was gone. A brief and rather excited discussion ensued before finally getting into their car and making their way back to London. 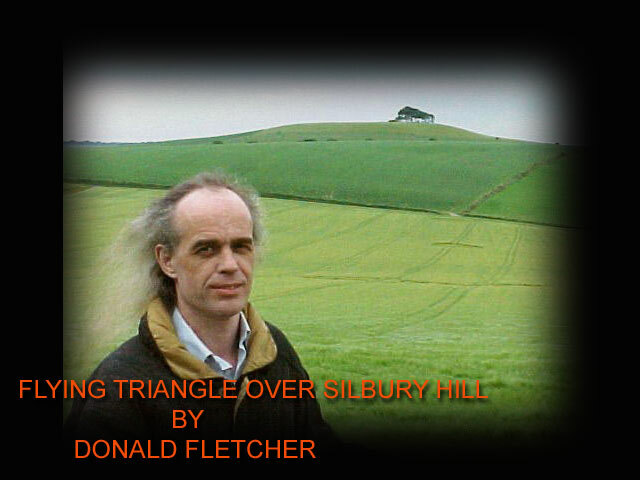 Early next morning, within wheat field in Yatesbury (Wiltshire) a triangular shaped crop formation was discovered. Yatesbury is less than three miles north-west of Silbury Hill, and was also the same direction in which Chris and Jonathan first stopped the triangular body of lights. Sadly the farmer owning the land would not allow anyone entry into the field before it was harvested. So, unless there was any intrepid cereologist out there who was prepared to risk life, and limb in order to obtain measurements and samples of the formation (And I sincerely hope there was) there is no way of ascertaining the authenticity of the formation. However, aerial photographs taken over the area show an equilateral triangle with three small circles positioned at each of the three pinnacles with a smaller circle, or grapeshot, situated above three circles of one of the pinnacles. Photographs also indicate the meticulous precision in which the crop formation was laid. Now where is that intrepid cereologist?